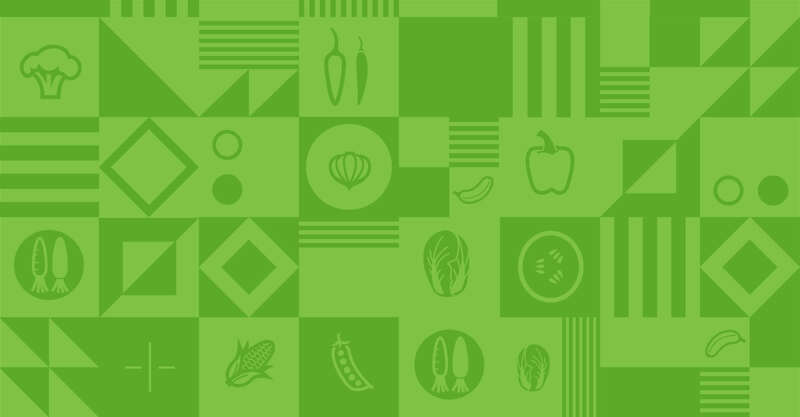 Can eating your veggies be fun? 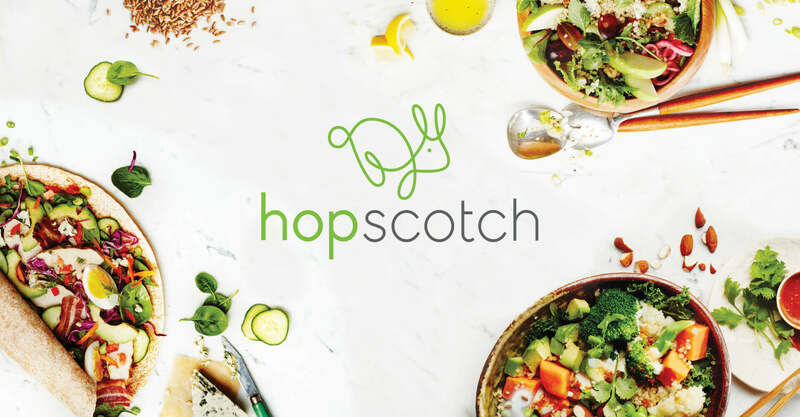 We knew that between Hopscotch’s healthy chef-inspired fare, and a playful brand image & voice courtesy of Jump, the answer could be yes! 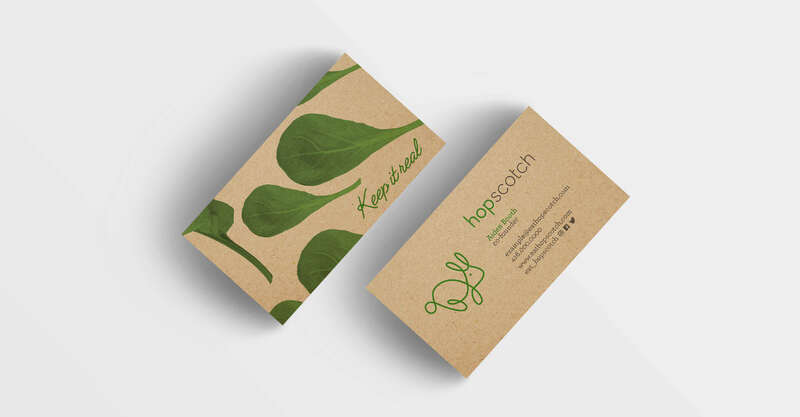 After creating a concept that is as fresh and green as Hopscotch’s food, a brand was born. 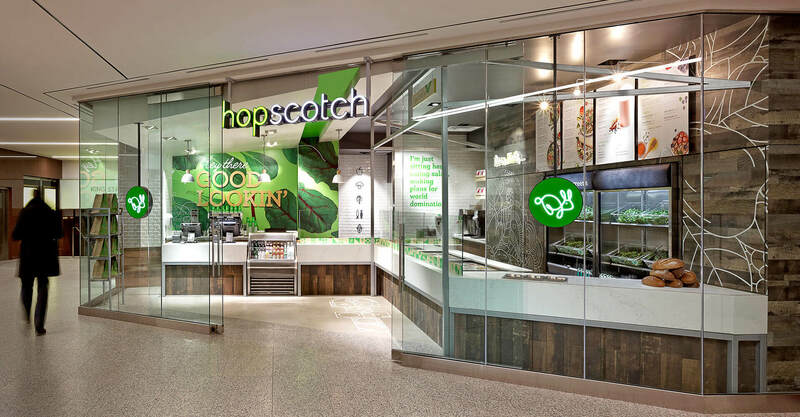 Hopscotch was a new quick-serve restaurant concept focused on healthy eating & finding beauty in simple fresh food. 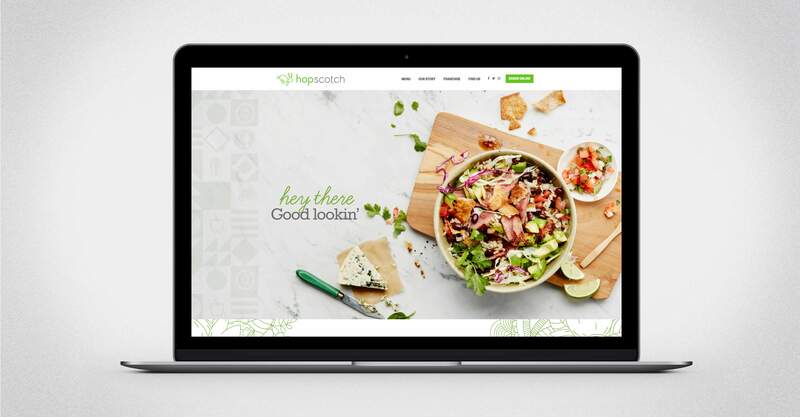 They needed an eye catching retail space to help them stand out in the competitive Fresh Greens category, and Jump was happy to lend a hand. 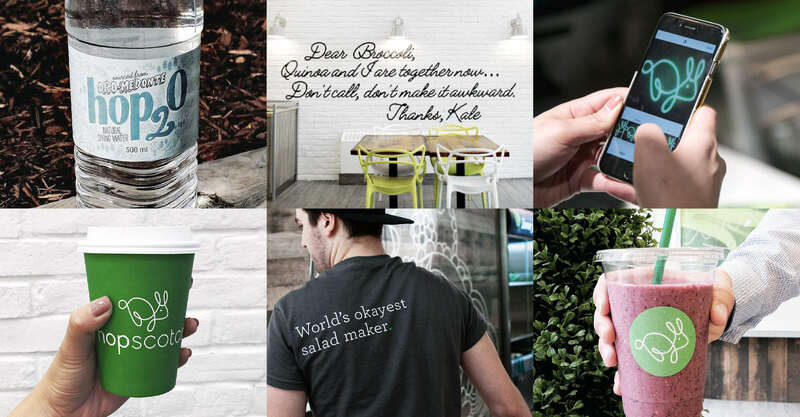 This was achieved primarily through integrating a playful brand voice and personality into the restaurant. 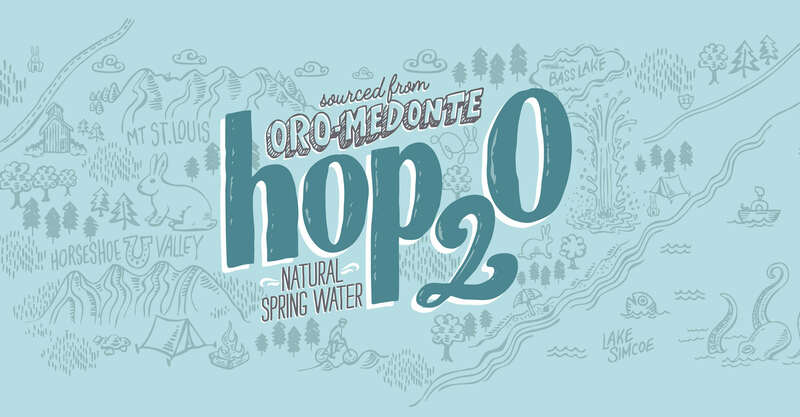 But the first step was coming up with a lively brand name that conjures up memories of simple happy times. 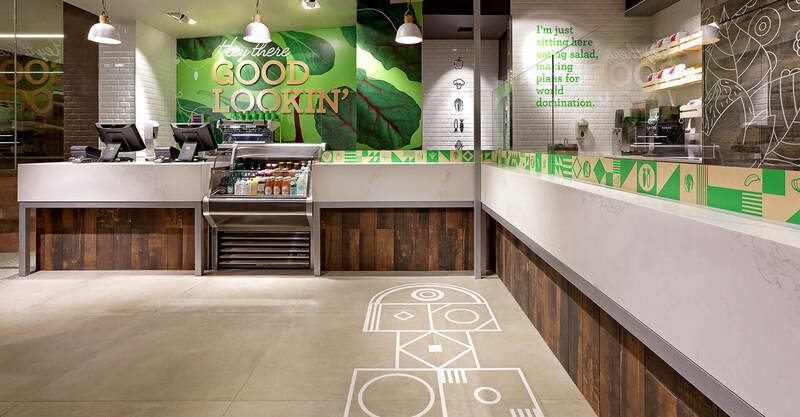 The customer recognition of the brand name is strengthened by applying the hopscotch game on the concrete tile floor, both providing a signature element of the brand and a smile on the face of the guests. 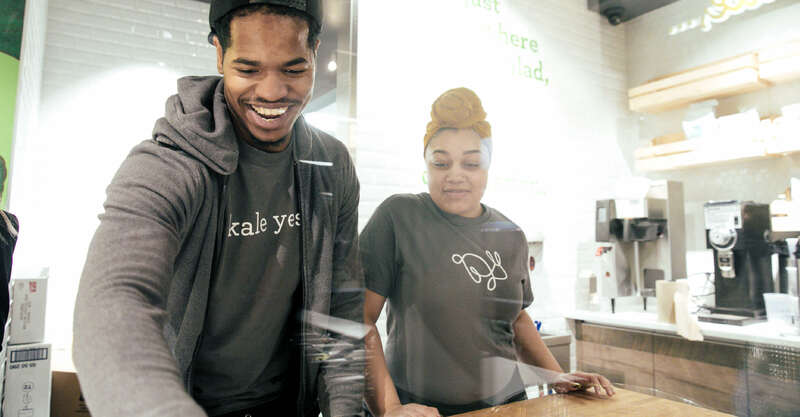 Quirkly veggie related quips like “Dear Kale, it’s not a popularity contest. 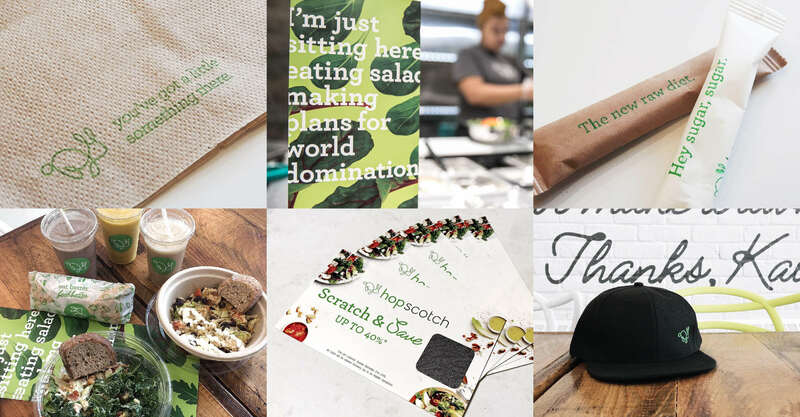 Love, Broccoli” were integrated into the restaurant space, collateral materials, and the online presence. This helped bring a further sense of whimsy and entertainment to the brand voice. 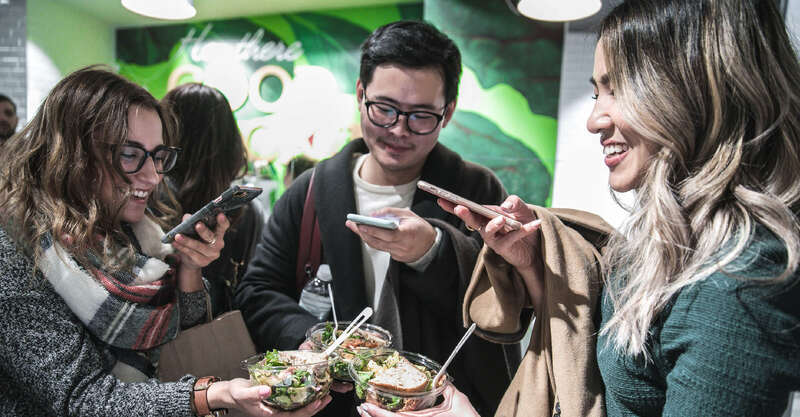 Building on the “eat your greens” mantra and the memories that coincide with a youthful expression helping to build the socialness into the brand. 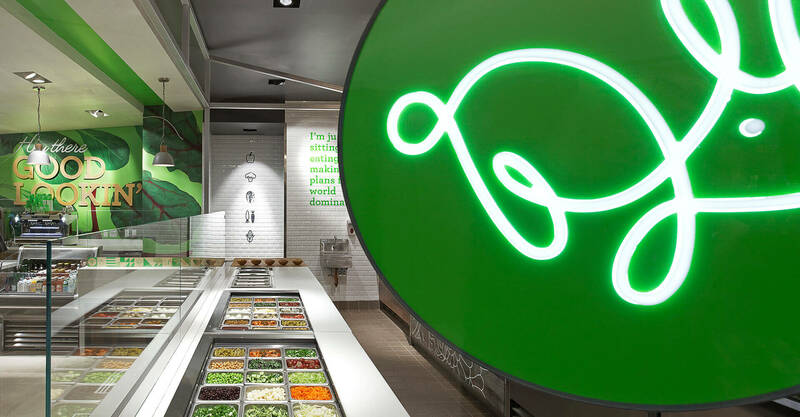 The space is bright and vibrant with strong use of greens and whites promoting the freshness of the offering. 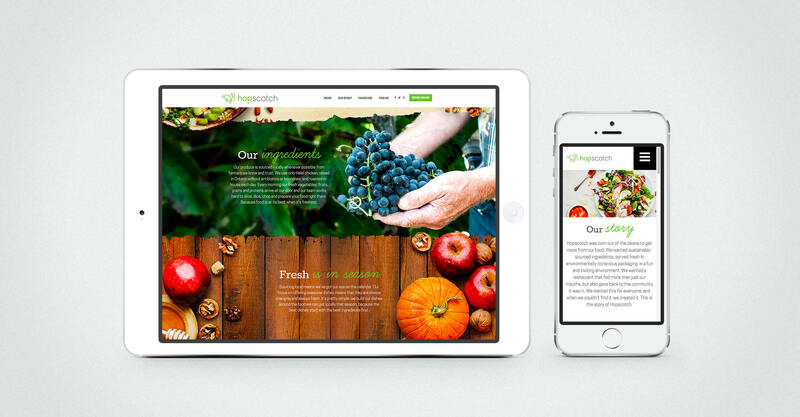 As well as utilizing cues from greenhouses and rural country in an urban modern execution. 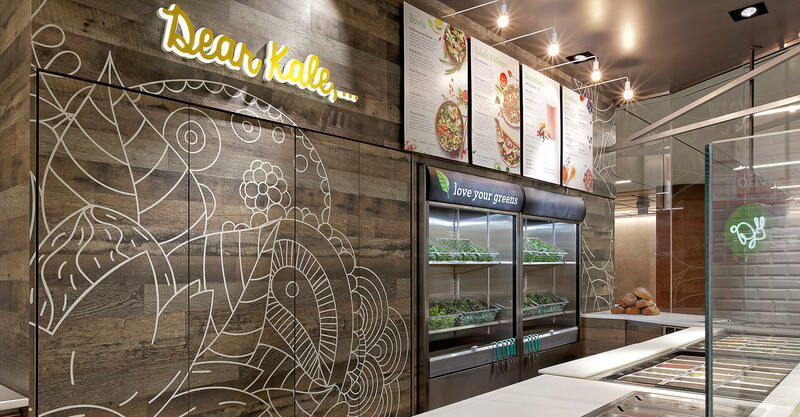 Menu boards are simple designed with each board highlighting the category; salads, wraps, smoothies for quick reference. 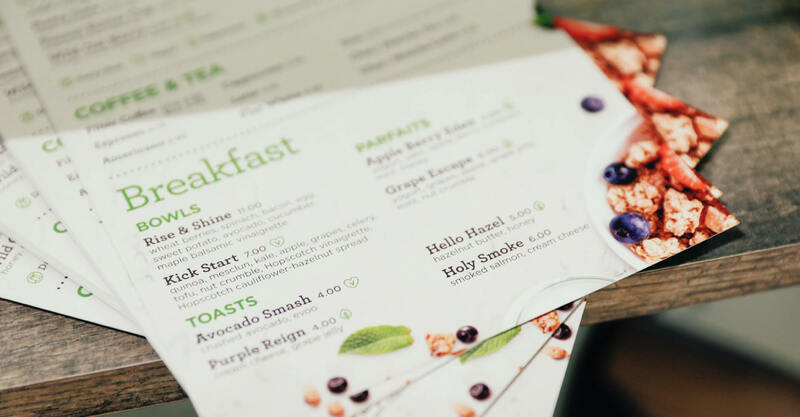 Each menu item lists the chef-inspired ingredients. 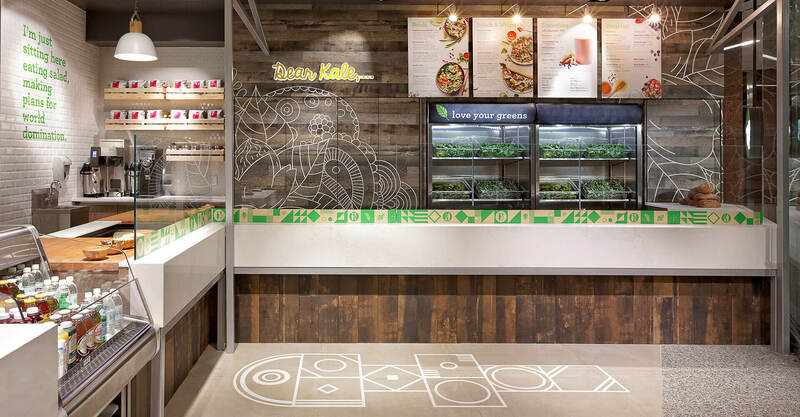 The illustrative linework of veggies, fruits & leaves applied to the wood softens the space with an expressive style. 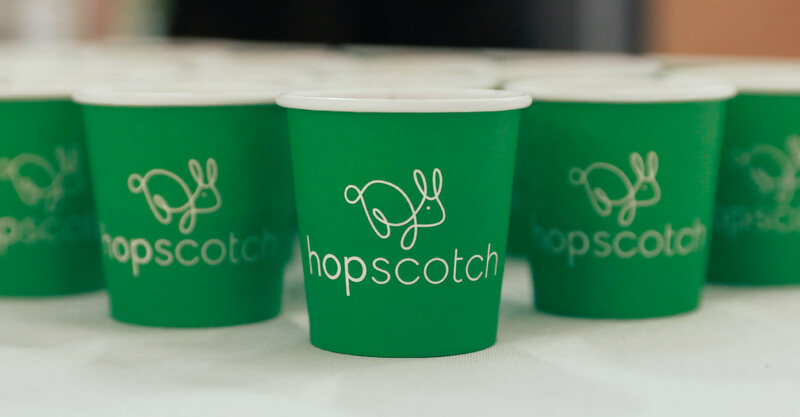 Hopscotch is friendly, fun, approachable and inviting to engage. 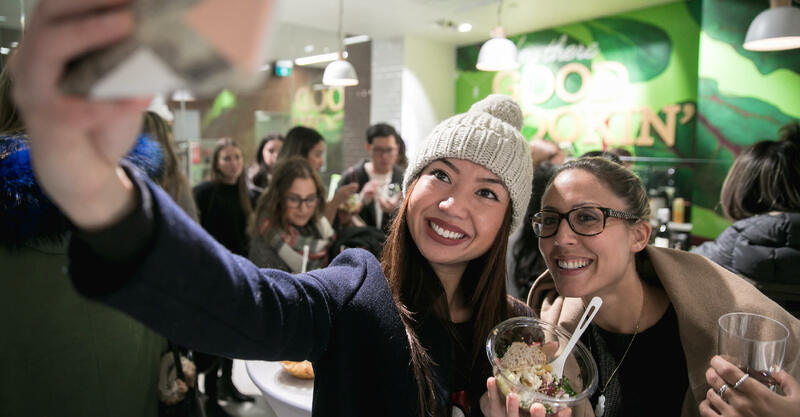 Customers immediately gravitated to the brand and line ups have fair exceeded our client’s expectations.